Squirrel Design started as a dream of our own: with a young family and time-consuming day jobs, we were searching for a way to entice the children – and indeed the whole family – outside, and put our own creative skills to a satisfying use. As we had always known that tree houses and special hideaways are magical for all ages, this is where we turned to and our own project became the first Squirrel Design. As parents we firmly believe that it is essential that children learn to use their imagination and experience the outside for real. It seems that too many children miss out by burying their heads in the TV or a computer game rather than sliding down a zip-wire, climbing a rope ladder or acting out their greatest adventures. There are many ways that children can be encouraged to learn and explore through playing outdoors and at Squirrel Design we have become experts in firing the imagination. Life’s experience tells us that it can be just as important for other members of the family to have their own special outdoor space – whether for some peace and quiet (a summerhouse?) or for more practical reasons (a garden office?). 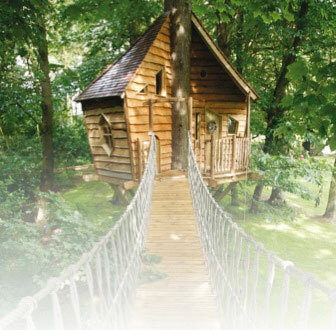 Our love of the countryside, my lifelong love of working with wood and Sarah’s design and illustration skills have come together to enable us to offer a comprehensive design and construction service for Squirrel Design tree houses and garden retreats (and our children are often extremely useful test-pilots!). We have a dedicated team of talented craftsmen who can bring specialist knowledge and experience to each bespoke project. Squirrel Design has developed organically to become the successful business that it is now.